Returning Reece Meekums secured a last-minute winner as Worthing beat Folkestone Invcita 3-2 in a thrilling game at Woodside Road this afternoon. Worthing trailed 2-1 going into the last ten minutes but an own goal and then Meekums' late strike took Adam Hinshelwood's side to victory and moved them up to fourth in the Bostik League Premier Division. Worthing came out all guns blazing in the first half as Hinshelwood fielded last season’s effective attacking trio of Meekums, who re-joined on loan from Bromley yesterday, Jesse Starkey and Zack Newton alongside David Ajiboye. Things were physical from the get-go and Folkestone went ahead in the tenth minute when Adam Yusuff wrestled off Will Miles and crossed for Kane Rowland to score in the tenth minute. Worthing's front line quickly responded and Ajiboye threaded a through ball to Newtown, who chipped into the side netting. Folkestone's brash style cost them in the 24th minute as Ronnie Dolan wrestled Meekums to the floor and Rents stepped up to curl home the resulting free kick - his second in as many games. Moments later Worthing could have gone ahead but top-scorer Ajiboye missed an open goal from Starkey’s turn-and-cross. The visitors were reduced to ten men just before the break when Alfie Paxman was given a second yellow card after tripping Newton. Worthing could not capitalise on their numerical advantage as the final pass constantly let them down. They were punished in the 58th minute when Folkestone went back ahead as Dolan fired past Kleton Perntreou and into the bottom corner. Again Worthing responded with energy, first Meekums then Ajiboye went close in the six-yard box. Ajiboye missed another opportunity when he blazed over after Miles headed down a corner, then had a good header tipped over by Tim Roberts and then another shot blocked at close-range. Worthing got the equaliser their pressure deserved when Rents' cross was turned into his own net by Folkestone's Callum Davies. 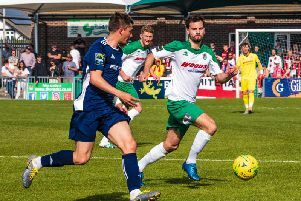 The galvanised Worthing team then pushed and pushed, with their efforts finally paying off in the 89th minute when the returning Meekums bundled the ball home. Worthing boss Hinshelwood said: "We played some really good stuff - we just make the games hard work, really. For all of our good play in the first half we didn’t work their goalkeeper anywhere near enough. "Folkestone were a good side. With the squad they've got they're a real threat going forward in the final third. "Even though we were 2-1 down with ten, 15 minutes to go, we still had that belief to go on and win - we’ve got that this year. There’s a real togetherness and belief." Worthing: Perntreou, Parsons, Rents, Budd (c), Crane, Miles, Ajiboye, Barker, Newton, Meekums, Starkey Subs: Clarke, Rance, Aguiar, Skerry, Kealy (Starkey).